For the perfect flower arrangements, look no further than Bloooms At The 49th in Ladysmith, BC. Our expert florists beautifully arrange flowers and gift baskets and provide outstanding customer service. 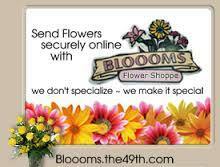 At Bloooms At The 49th, we offer flower delivery to Ladysmith and surrounding areas. We can also provide nationwide delivery through our network of trusted florists. Don’t worry about last minute gifts – Bloooms At The 49th is pleased to offer same-day floral delivery for no additional cost.